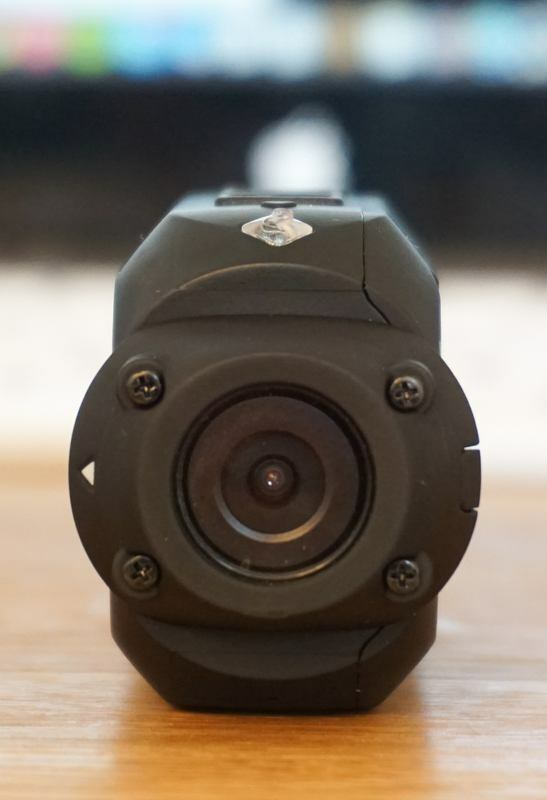 Action cams are a great way to relive fun experiences, and also provide the reassurance of video evidence should anything untoward happen while cycling. I’ve run a camera on my bikes for a few years now, my current one being the Garmin Virb Elite. The Drift Stealth 2 has a similar form-factor to the Garmin, but is about half the size, so I thought I’d see how well it stacks up. I’m not doing this as a head-to-head with the Garmin, but as that’s been my daily driver for quite some time now, it’s inevitable that I’ll be making a few comparisons along the way. The Stealth 2 is small and light, at 80x42x27mm (3.15×1.65×1.06 inches) and weighing just 97g (3.42oz). 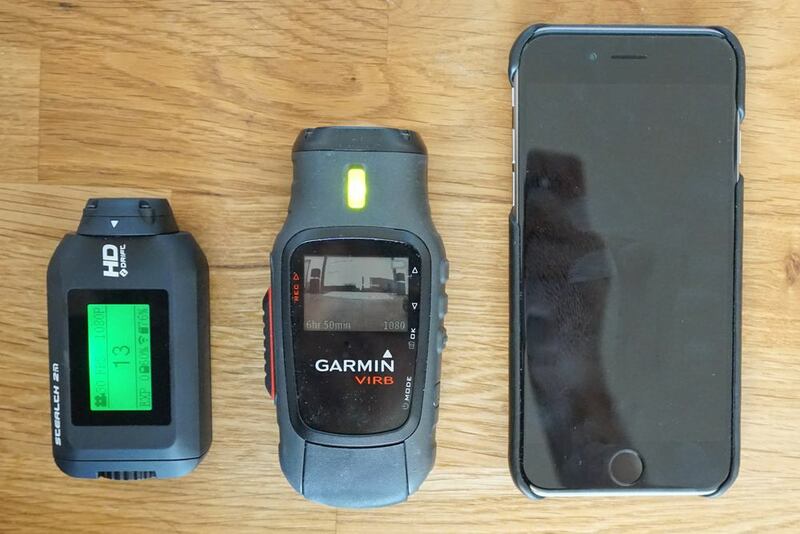 It’s roughly the same thickness as the Garmin, but overall feels a lot smaller. I’m also showing it here with my iPhone 6, for scale. It has the standard ABS plastic finish, and feels robust. I’ve had no qualms chucking it unprotected into a bag when not in use, and I wouldn’t worry at all about dropping it. The second thing you notice after the size is the fact that there’s no camera view on the screen. The Garmin has a non-backlit e-ink screen to preserve battery-life, but it’s an always-on one that lets you see how the camera is aligned. With the Stealth 2, you have to use the iPhone app – of which more in a moment. To connect to the app, the Stealth 2 generates its own WiFi hotspot. Switching this on involves a lot of button presses on the camera to cycle through settings screens and activate the WiFi, but it’s not a task you’ll need to do often. For most applications – including mounting it on my bicycle handlebars – you only need to do it once, to get the alignment right. After that, you’re going to get the same view each time. One benefit of using the iPhone as a viewfinder, though, is that you can align the camera even in an awkward to reach place. The iPhone obviously also provides a much larger viewfinder than you’d get on the camera itself. There’s a slight lag in the image reaching the phone, around half a second or so, but this again isn’t generally going to be a big deal when you’re just using it for alignment. 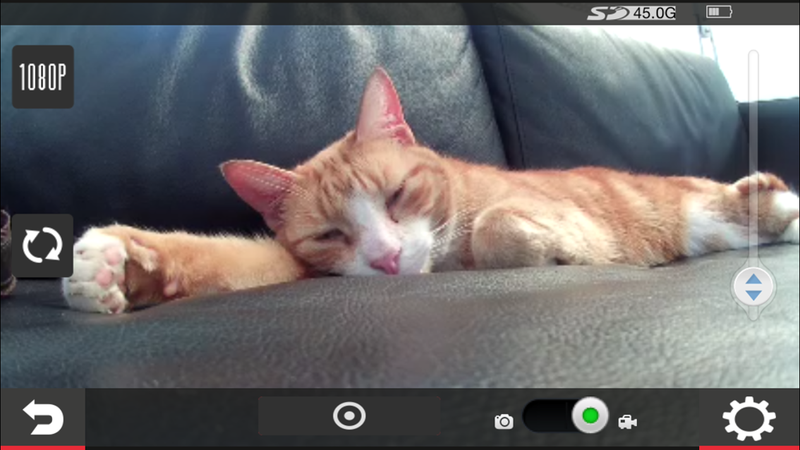 Here’s a screengrab of the iPhone display, with an office cat helping out. Depending on how you mount the camera, you may want the video turned 90 degrees or even upside-down. 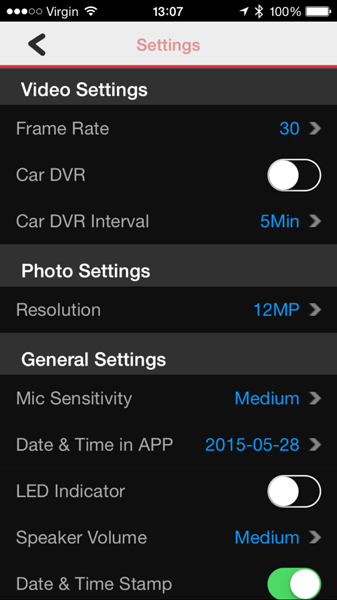 With most action cams, you have to delve into the settings to choose the video orientation. I was expecting here to have to either do that or set the orientation in the app. As it turns out, you don’t have to do either. The Stealth 2 has a neat swivelling lens. On my bike, the handlebar mount holds the camera horizontally, so I point the white arrow upward. But if I wanted to use the camera vertically, as you might attached to a helmet, you simply swivel the arrow around until it faces up. This means you can mount the camera at any angle: horizontal, vertical or any angle in between. It would have been nice if the optional handlebar mount allowed the camera to be held vertically on a bike, to take up less space, but unfortunately it doesn’t. Starting and stopping recording is easy, even with gloved hands. Press and hold the combined power/start/stop button on the side of the camera to switch on and you get an easy-to-read mono display with green backlight. Press the button again and it starts recording, the backlight changing to flashing red. Press again to stop recording. The color-coded backlighting is very easy to see indoors, but almost invisible in sunlight. This isn’t a problem, however, as the information change on the display as it starts and stops recording is very visible. 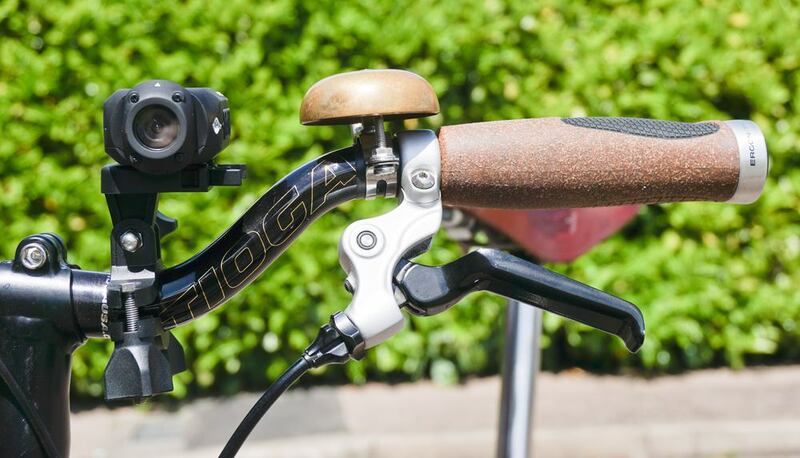 The handlebar mounting system is my first real complaint about the device: it can be fiddly to remove, as it slides out sideways (to the right as we look at the photo below). This is actually quite tight with my Brompton’s custom bars, fouling the bell and having to be wiggled out. It does work, but it’s nothing like as good as the Garmin system. This means you have a big chunk of plastic still attached to the camera when you slide it off. Admittedly it only takes a few seconds to unscrew it, with no tool required (although you can see a screw, you can simply use your fingers in the recessed area), but you then have another part to try not to lose. I have a similar complaint with charging. With the Gamin, you lift up a rubber flap and connect the MiniUSB cable. With the Stealth 2, you have to unscrew and remove the cap. Again, there’s a thumbwheel which means it’s easy to do, but you again have a loose part that could get lost (and the cap is essential to the waterproofing, so you can’t just do without it). Settings can be controlled from the camera itself, but even with all the button-presses needed to switch on the camera’s WiFi, it’s easiest to do most settings changes within the app. In your iPhone settings, connect to the Stealth 2 WiFi and then hit the settings icon in the Drift Connect app. 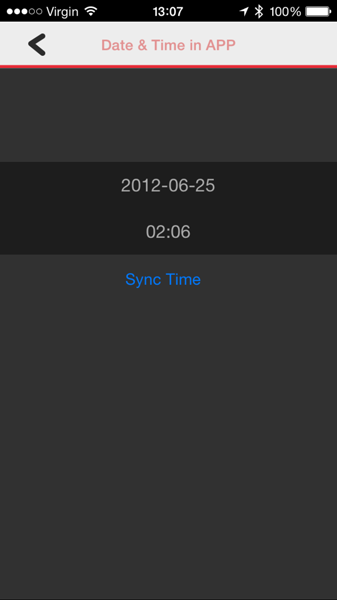 You can also avoid the usual fiddly date and time settings by simply pressing the Sync Time button to match your iPhone’s date and time. The highest video quality is 1080p at 30fps, and this is, as you’d expect, excellent. The 7-element lens has a 137-degree field of view, which is a little less than the Garmin’s 146 degrees but still more than good enough. When cycling through traffic, for example, you get a good view of the cars either side of you. Let’s start with a static clip. It’s a very boring waiting-at-lights shot, but I wanted to start with this to show that the jumpiness seen in the moving shots is down to bumpy roads and vibration, not the camera. Now let’s see a moving shot. London road surfacess are not the best quality, and the bumpiness seen here is exactly the same as seen with other handlebar-mounted cameras. By the way, I should state that lane-splitting – or filtering, as it is known in the UK – is perfectly legal in the UK. Use of bicycle lanes is also entirely optional. As evidence in the case of an incident is one of my reasons for using a camera, it’s important that you can get a clear image of the plates on cars – and this is no problem. 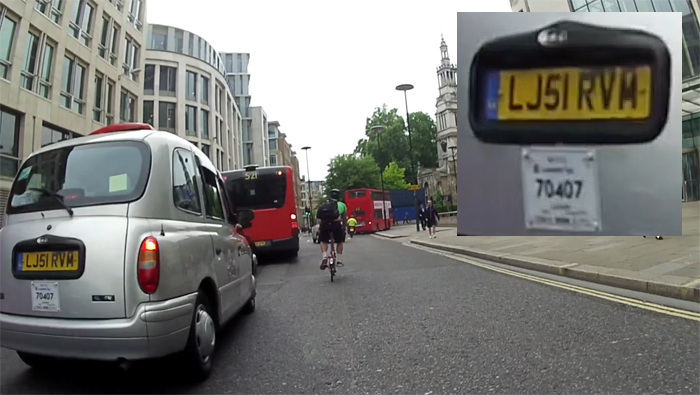 Because I’m downsizing the framegrab a lot here, I’ve included a crop of the taxi plate, in which both index number and cab registration number are easily readable. Finally, while daylight performance can be fine even with cheap cameras, it’s night-time footage where you get what you pay for, and here the Stealth 2 is excellent – on a par with the Garmin. Number plates are again very readable. As with the Garmin, the Stealth 2 has all the advanced features you’d expect of a high-end action cam, including timelapse and loop recording modes, and each works well. 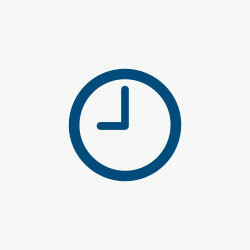 Drift claims a battery-life of three hours. As always with manufacturer claims, that’s for a single continuous recording in ideal conditions. In practice, with stop-start recordings, WiFi use with the app and some fiddling with settings, I got 2h 37m – which is almost identical to the performance of my Garmin. Unlike the Garmin, the battery isn’t removable – so you can’t carry a spare to extend recording times – but that’s unlikely to be an issue for most usage. 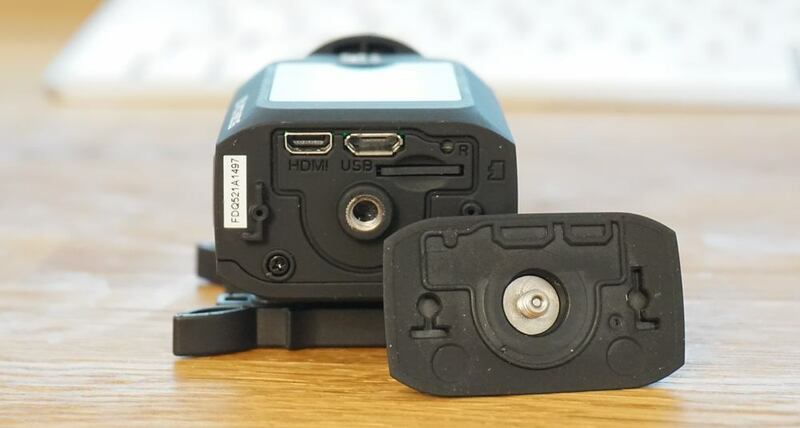 I’m a great believer in the old adage of ‘buy the right thing once.’ There are a great many cheap Chinese action cams on the market these days, and some of them have impressive-looking specs. The common factor, among most of the people I know who’ve bought one, is that they don’t last long. Either the video quality isn’t as advertised, the low-light performance is dreadful or they simply break. The Drift Stealth 2’s original RRP of $249 isn’t cheap, but neither is it an unreasonable amount of money for what you get. At the reduced price of $199 plus $20 for the handlebar mount (and a similar price on Amazon for some packages), it’s a decent price for a high-quality camera. As I said at the outset, I’m a big Garmin fan, so for me to be tempted to switch to another brand, a camera has to be good. 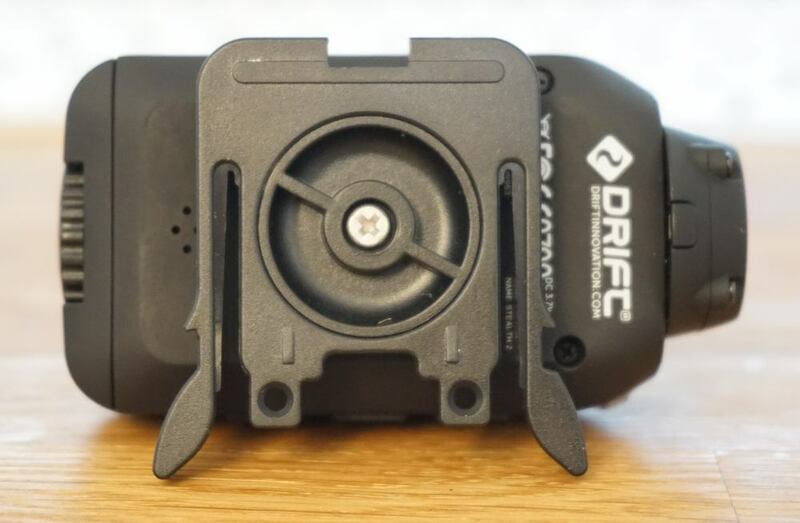 I still prefer the handlebar mount of the Garmin, but I have to say the much smaller and lighter form-factor of the Drift Stealth 2 makes it a very worthy competitor.